I decided early on that I wanted my own room. Many of the apartment sharing options in the downtown/CBD area (near my work) had multiple people in each room. For $200+/week I could have the privelage of living in a 2 bedroom apartment with 5 other people, or possible more. Not overly inviting, though being able to walk to work was a nice thought. I started looking further abroad. One difficulty was that outside the CBD I never really knew what the different areas and suburbs were, as I’d only visited further away ones like Manly and Bondi. 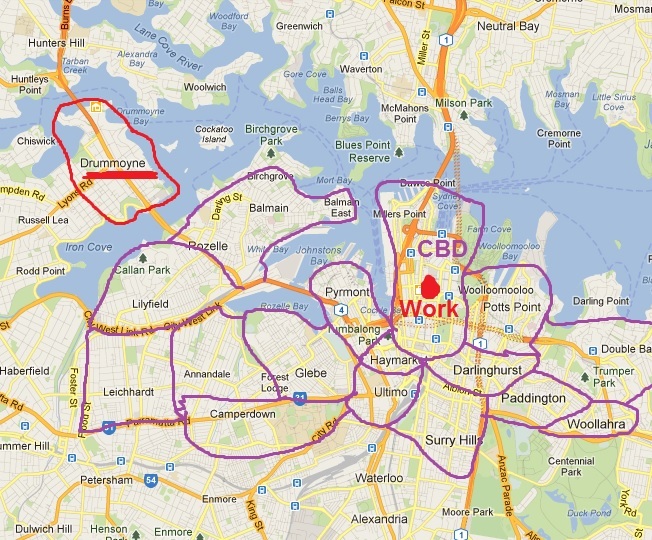 So when looking at apartments online that say ‘Glebe’, ‘Leichhardt’, ‘Balmain’, etc, looking at a map doesn’t really say much until you try to get there by bus, walking or ferry. So I began with the nearest spots to the CBD. I tried to see an apartment in Surry Hills, but nobody was there to let me in and actually see the place. The place I saw in Glebe was run down and in shabby shape, though the local area was nice. I started pushing further out. I saw a house with a crazy cat lady in Leichhardt. I was starting to get disheartened already, most of these places were woefully overpriced and not very enjoyable looking. Then I decided to take to the water. Sydney has an good ferry transit system that I could use to get to the CBD, free of traffic issues. The first, and last place I looked at was Drummoyne. Pretty much upon arriving in the suburb I felt much more at ease. I had left behind the busy and congested streets of the CBD and inner suburbs for nicer apartment blocks and houses. Yet, prices dropped due to the slightly further distance to the city. The ferry took a short 15 minutes, and I explored for an hour before my first apartment appointment. I ended up seeing 3 apartments that night, all of which could have been okay. But I ended up with the second apartment I saw, at Drummoyne’s upper north end, with two women. 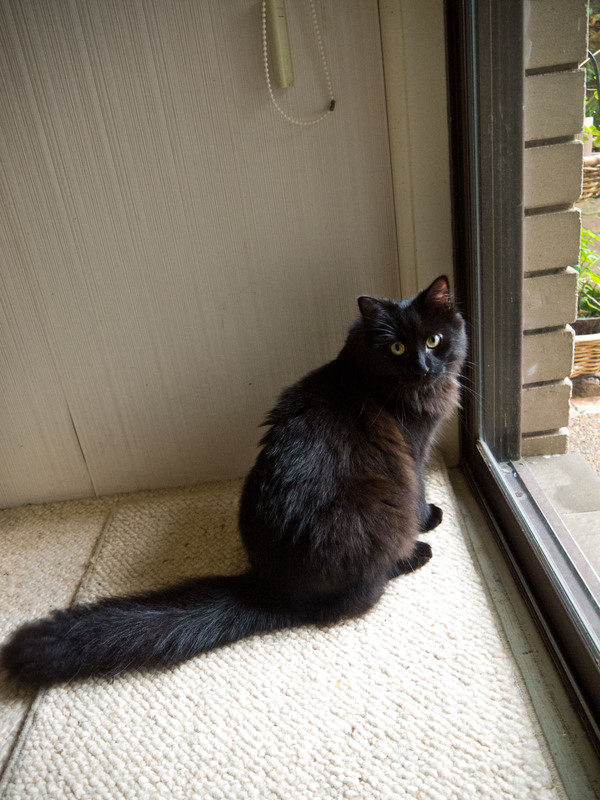 And a fluffy black cat. While I would end up not using the ferry that much (the bus was just as quick and much more convenient), the location would be a perfect home and the flatmates were pleasant. It worked out to be a great place to lay my head for the next several months. This entry was posted in Australia, New South Wales, Personal by Colin. Bookmark the permalink.